I first met Mark Beckett in the recording studio, as the drummer on the demo recording session I was producing 7 years ago. From that first handshake, smile, and his performance that day as we went from song to song, genre to genre, I was hooked. What a drummer, percussionist, session player. A living, breathing, very cool metronome, and a really nice guy with a great sense of humor. He's played with so many great artists and songwriters already and he's still a young man. Steve Cropper, Delbert McClinton, James Burton, Mark Farner, Randy Owen, John Kay, Lee Roy Parnell, to name just a few of a very long list. This interview was done immediately following his show backing up the great Little Jimmy Dickens at Opry at the Ryman Auditorium, May 21, 2010. 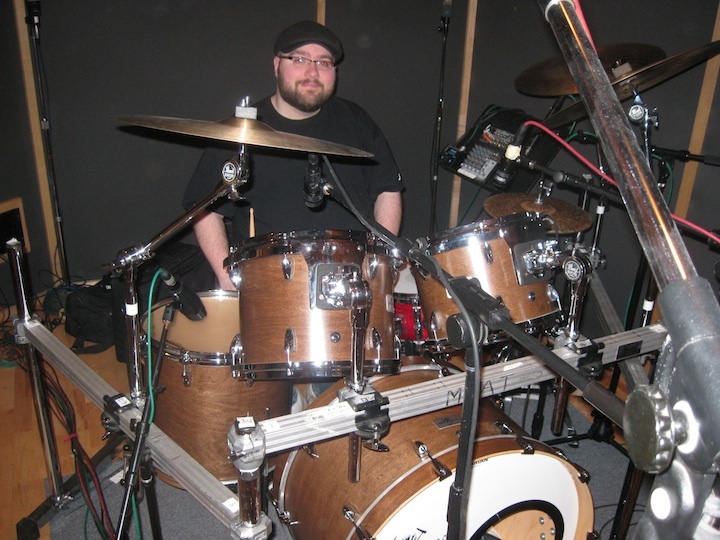 One of the top drummers in Music City USA, meet Mark Beckett. Bronson: Do you remember your first paid gig? Mark Beckett: I do remember my first paid gig. It was in 1994 at 12th & Porter for a songwriter named Chris Eddy and I was still in high school. He was a writer and would use me on some of his songs for sessions and he asked me to do a gig with him. Yeah, 1994. Bronson: So where are you from originally? Mark Beckett: Florence, Alabama. Lived there till I was 10, then we moved to Nashville. Bronson: You play in the studio and you also play live. Do you have a preference? Mark Beckett: No. Both of them are amazing, especially when it's a great band. I think my heart is in the studios just because when I first started playing drums, I had to be just like my hero, Eddie Bayers, and everything revolved around him and so I wanted to do sessions from the get go, so maybe that has a little more in my heart. Bronson: Why did you choose the drums? Mark Beckett: You know I was sitting in the car one day with my brother when I was 14 and I was tapping on my legs and he said, "Man, you need to play drums. ", and we were listening to a Rodney Crowell record and it just happened to be Eddy Bayers and my Dad (Barry Beckett) playing on it and very soon after that I met Eddy and I was just drawn to the drums for some reason. Bronson: Do you have any advice for anybody that's new to Nashville trying to break into it, trying to get noticed? Mark Beckett: I would say meet as many people as you can, sit in as many places as you can and get to know songwriters, get to know other musicians and just meet people. That's about the best way I can think to do it 'cause once you start meeting people and they remember your face, they might need you one day and then call you, it's a building process. That's about the best I can recommend. Have a way of sustaining yourself so you're not freaking out, you know, if work doesn't come in immediately, but just getting out there and meeting people. Getting along with people. Bronson: You've played with so many people. Do you have a favorite style of music? Mark Beckett: My favorite style of music is old R&B. I love old R&B music from the 60's and 70's. Love Sam Cooke, love Otis Redding, The Staple Singers, Aretha Franklin, Etta James. That's my favorite. Bronson: So did you have any formal training or you just started playing? Mark Beckett: I took lessons from 2 teachers, one of which Harry Wilkinson and the other, Ralph Pace. But I would always kind of blow off the lessons and try to trick 'em that I would really practice but what I was really doing for 3 or 4 hours a day was putting headphones on and listening to records. Listening to Eddy Bayers, Roger Hawkins, Jeff Porcaro, you know, those guys, Larrie Londin. Trying to mimic what they were doing. Bronson: What kind of drums do you play? Mark Beckett: Right now I'm with a company called Nashville Drum Doctors, a guy named Eric Amundrud, out of Bellvue, and he built me a kit. I just went up to him, sat down with him and we just went over specs and he did a fabulous job building drums. I'm with Soultone Cymbals out of Encino, CA, Aquarian Drumheads, and Pro-Mark Drumsticks. They're all just really good to me and great companies. Bronson: So now you're on the staff at the Opry, playing drums. How do you like that? Mark Beckett: It's amazing, it's just absolutely amazing. I rotate 2 weeks on, 2 weeks off, with Eddy Bayers, which in itself is great, sharing it with your hero. It's an amazing institution, it's an amazing band, and it's something I really look forward to every day when I get to do it. Bronson: Are you still doing any traveling work or are you just staying in town because you got this? Mark Beckett: No, I stay in town. If the right call came in I would consider it, but I like staying in town. Sessions and the Opry are where my heart is.